Priest River, ID: Lone Wolf Distributors announces the pre-sale of new Timberwolf Large 10mm/45ACP polymer frame. For the past few years, Lone Wolf has been talking about the release of a 10mm/45ACP sized frame in their Timberwolf polymer frame line. According to a recent email release from Lone Wolf: “the time for talking up “vaporware” has passed!” The new Timberwolf Large frames have come to fruition and they are now accepting pre-orders while they wait for the final patent process to take effect. 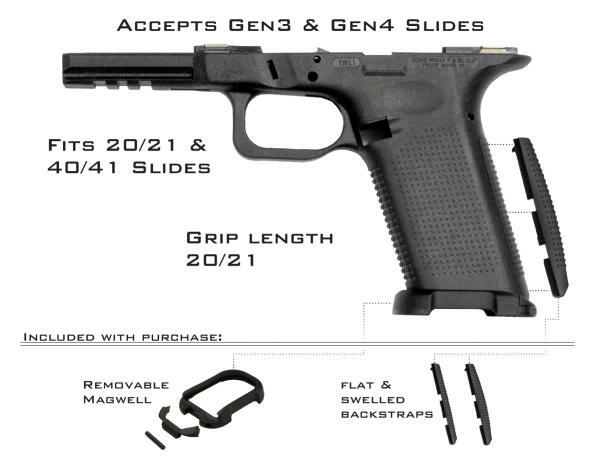 Based on the Glock platform, they are compatible with any G20, 21, 40, or G41 slide and incorporate enhanced ergonomics, including an ultra-low bore axis, and a true 1911-style grip angle. Also, Lone Wolf touts the new Timberwolf Large frames as only being fractionally larger overall in grip circumference than a Glock 17 frame. A “9mm-sized frame”, but with a major power upgrade! The new frames are being sold either bare, bare + parts kit, or fully built, with a starting MSRP of only $124.95.